Video Game Repair in Brunswick, ME! WE'VE MOVED - NOW AT SUITE 21 in the same shopping plaza! Looking for a video game store in Brunswick, ME? 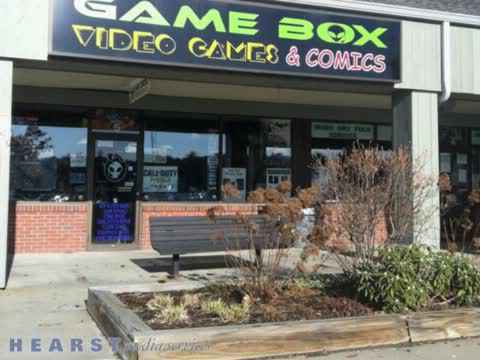 Welcome to Gamebox Video Games & Comics, your top source for video games and comics! We are located at 49 Topsham Fair Mall Rd in Topsham, Maine 04086. Previously located in Brunswick, ME, we relocated several years ago to the Topsham Fair Mall. We are located just up the road from Game Stop in the Shaw’s Plaza. We buy/sell/rent video games, repair consoles, offer iPhone and tablet repair and other cell phone repair. We have a very large inventory of New & Used Video Games, from classic games to current next gen games; you will find everything you are looking for at Gamebox. Furthermore, we are a Comic Book Store! We stock a large inventory of comics. 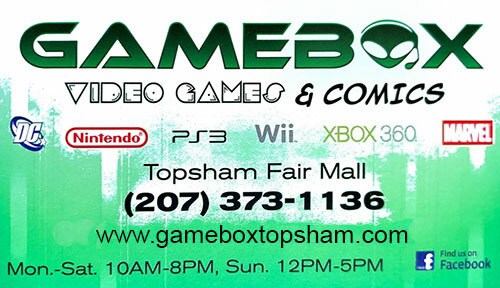 If you have never been to Gamebox, it will surely be your new favorite video game store in the Brunswick, ME or Topsham, ME area! Cracked iPhone screen? Speaker not working? Phone not charging anymore? Walk in today for reliable iPhone repair. We are experts at iOS device and iPhone repair, but not limited to it! Bring in your broken device and we’ll give you a free assessment of the cell phone repair or tablet repair cost. At Gamebox, we offer New, Used and Rental games. We can also fix your scratched game disc. Whether you are looking for the newest video games for Xbox, Wii, PS3, Wii U, VITA, 3DS or PSP GO, we have it! We also have a large inventory of classic games for PS2, Nintendo, SNES, Sega, Game Cube, N64 and more! Looking for something specific? Just give us a call or pop-in! We are also happy to help! If you are a fan of Game Stop, then you will LOVE our store! In addition to selling new and used video game consoles, we also offer video game repair for all major game systems. We will also purchase your broken system from you! Xbox 360, PS3, PS2, Nintendo Wii, Nintendo DS, DSi, XL, 3DS, Playstation Vita, you name it, we repair it! Looking to play MAGIC: The Gathering? We got it here! We stock many table top games such as Dungeons & Dragons, Warhammer, Magic: The Gathering. We also have monthly Poke Mon events in store. Our comic book store offers a very large inventory of comic books! We also get new shipments regularly so stop in to check out our stock! Whether you are looking for that hard to find used game or want a brand new system, Gamebox Video Games & Comics has you covered. Make sure you call us with any video game repair or cell phone repair needs as well! We are just a short drive from Brunswick, Maine and certainly worth the trip from much further! We are open 10-8 M-F and 10-6 SUN. Call us today at (207) 373-1136! Our video game store proudly serves the Brunswick, ME area.